Director Atlee has already proven his worth with films like Raja Rani, Theri, and Mersal. He is currently working on his 4th project, tentatively titled Thalapathy 63. It marks his 3rd consecutive collaboration with Thalapathy Vijay. After this project, he will be seen directing another actor with superstar status in the Indian film industry. Yes, Atlee will be directing Shah Rukh Khan in a Hindi film, after Thalapathy 63. Both of them were seen together at the recent IPL match between CSK and KKR. 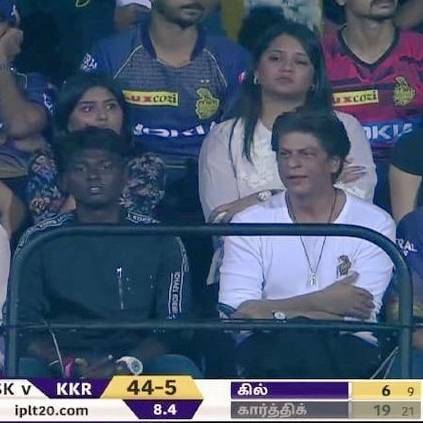 Following the match, the Bollywood Badshah went to Atlee's office and they were involved in a discussion. Sources close to us have spilled the beans that it will be a straight Hindi film and will not a remake of any film as discussed on social media. They've also revealed that SRK was impressed with Atlee's work. This is a great news for fans of both Atlee and SRK. Shah Rukh Khan was last seen in Aanand L Rai's Zero, that received a lukewarm response. Atlee is currently working on Vijay's Thalapathi 63, that has Nayanthara as the female lead. It also stars Vivekh, Yogi Babu, Daniel Balaji, Reba Monica John and others as a part of its cast. GK Vishnu is the cinematographer, while AR Rahman is the music composer. The film is bankrolled by AGS Entertainment. Stay tuned for more updates. People looking for online information on Atlee, Shah Rukh Khan, Thalapathy 63, Vijay will find this news story useful.